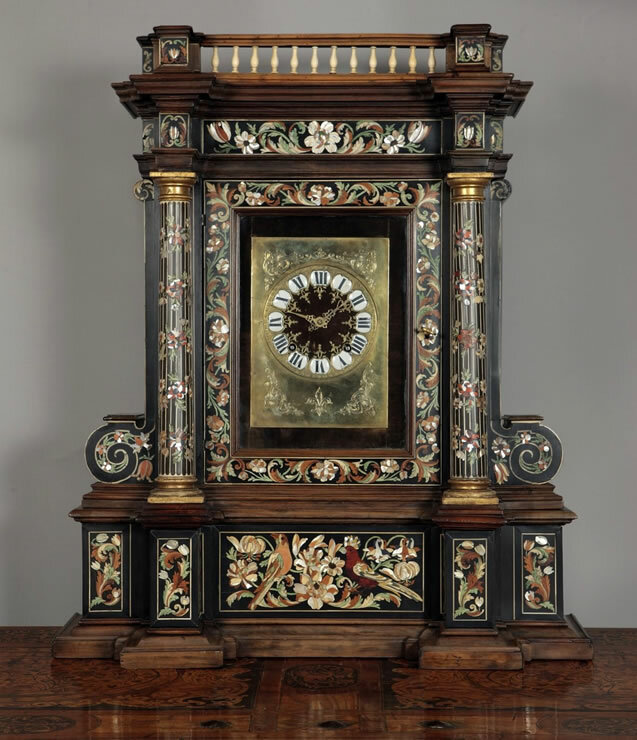 Rare Florentine baroque walnut, ebony, natural and stained bone, ivory and mother of pearl marquetry clock in the form of a façade with freestanding columns attributed to Leonard van der Vinne. The shaped plinth contains a drawer marquetried with birds, flowers and acanthus scrolls with protrusions supporting freestanding columns decorated with floral swags. Two volutes flank the movement that is located behind a glazed door framed with marquetry acanthus scrolls under an ivory balustrade. The sides are veneered in walnut and ebony. A similar clock, nearly the same size, and with very similar marquetry is plate V in Alvar González-Palacios: Il Tempio del Gusto; Longanesi & C., Milan, 1968. It is described on page 34 and is attributed to the Botteghe granducali and the workers Leonardo van der Vinne and Andrea Scacciati. The Flemish master intarsiatore (inlay artist) and cabinet-maker moved to Italy and worked at the Botteghe granducali from 1659 until 1713. Another clock from the Grand Ducal workshops with a similar façade form, but with pietre dure intarsia is in the Rosalinde and Arthur Gilbert Collection at the Victoria & Albert Museum. That case has a replacement German movement installed in the 18th century.